Everything life-changing has to start somewhere. Just like any love affair starts with a tentative first kiss; like a dream job starts when you walk through a door into the interview, sweating bullets; like a new addition to the family starts with–well–you know this one, the world of sport skydiving starts when you make that first tandem skydive. Well, it is: In much the way that you think something is a one-night stand and, and you find yourself married to the one-time-thing a couple years down the line. Skydiving will sneak up on you, that way. You probably already know that it’s not about simply, like, falling. There’s a chance you already know how interesting it gets, probably based on the videos you’ve seen. There’s the world champion Russian team doing ten thousand feet of coordinated, linked twists and flips. There’s the time 164 people got out of six planes, pointed themselves upside-down and linked together in a formation…or the time some wingsuit pilots and some glider pilots got together and had themselves a private airshow over Austria. This stuff–or, at least, the prep work for it–is going on overhead every time you visit a dropzone. You may RSVP in the affirmative by wiggling into a tandem harness and meeting the wild blue yonder in person. In order to do that, though, you’ll need a few pointers. Here are the details, so you don’t miss a trick. 1. There are surprisingly few physical limitations. Skydiving is a remarkably accessible sport. (Just check out Jarett Martin, our paraplegic friend who competes in skydiving championships.) There is, however, one hard and fast limitation: the weight limit for tandem skydiving. For men, this limit is 225 pounds; for women, it’s 170 pounds*. That limitation is in place in order to protect our students and our instructors, so we’re very firm on our weight requirement, which includes shoes and all the clothing that you will be wearing for the jump. Because the limitation is in place due to the total weight that the parachutes can support, you will be asked to stand on a (private!) scale when you check in for your skydive. If you’re in doubt about your status, we recommend that you pop down to see us at the dropzone prior to your jump. We’ll assess your situation and let you know. 2. Afraid of heights? No worries. We just from an altitude that’s just a little higher than the “normal” tandem skydiving height of 13,000 feet — 14,000 feet, to be more or less exact. While that may seem like a terrifying height to any acrophobic, you’ll be absolutely amazed at how triggering it’s not. Because there’s no terrain around for your brain to use as fodder for comparison, you’ll be conspicuously absent of your fear of heights. “Tandem skydiving height” and “edge-of-a-building height” are two totally different animals. Kinda cool, huh? 3. It’s so, so worth it. It’s the cost of tandem skydiving that gets some people, and we understand! That said: We do everything we can to keep your tandem skydive cost within the affordable range, while flatly refusing to compromise on the quality and safety of your experience. And y’know what? We’ve nailed it. 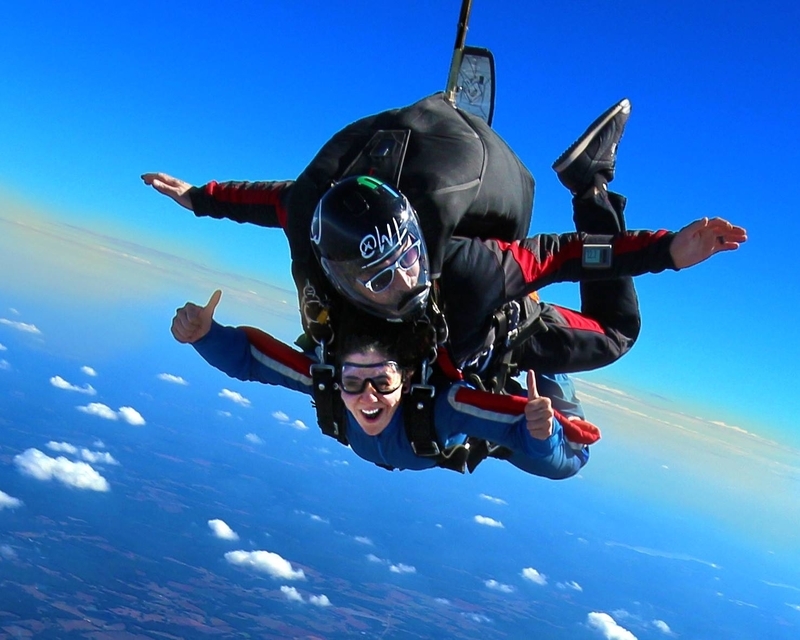 A tandem skydive at Skydive Monroe costs less than two hundred bucks–and that’s with a great, licensed, professional instructor, top-of-the-line equipment and a meticulously maintained aircraft. That’s hard to pull off, but teaching new skydivers is our passion. It’s worth it to us to see you smile. So–whaddaya say? Are you ready for the skydiving phase of your life to kick off? If you are, we’re ready to sweep you off your feet (and back onto them again). *Exceptions can be made for the women’s category of 170lbs, based on the individual’s fitness.